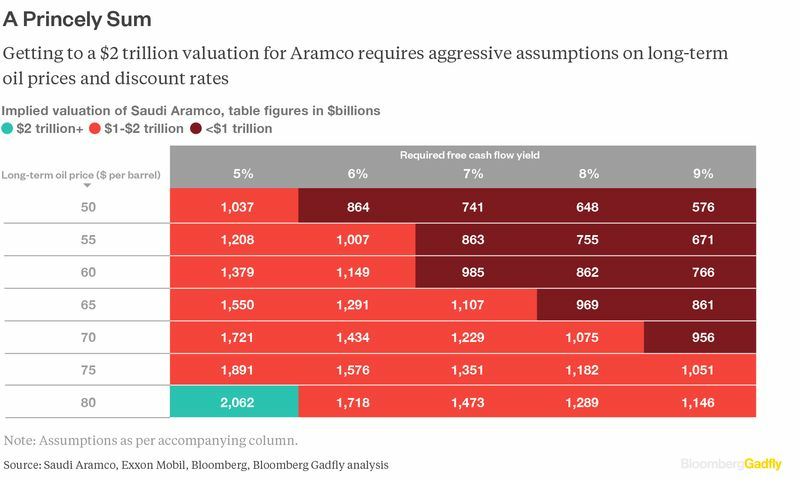 Two trillion dollars: this was the price tag Riyadh put on the jewel in its crown, state oil and gas giant Aramco. This is how much the company was worth, officials said, if you multiplied its proven reserves by a factor of US$8, which is the figure used to value oil and gas reserves. There were doubts about that valuation from the start, and now these are deepening as the company crawls closer to the initial public offering. For starters Aramco’s opacity was very likely to make potential investors suspicious. Oil is not going up to US$80 anytime soon unless something cataclysmic happens. Denning is also generously – and deliberately—not factoring in the inherent regional risk in the Middle East that is likely to act as a deterrent to potential investors. The publicity machine around the IPO has begun to creak already. Recently all those suspecting Aramco won’t make its own deadline for the IPO had to pleasure to be proved right: Saudi officials said it will be delayed until next year.